My husband and I are both huge Simpsons fans. We have over 500 episodes on our DVR to prove it! 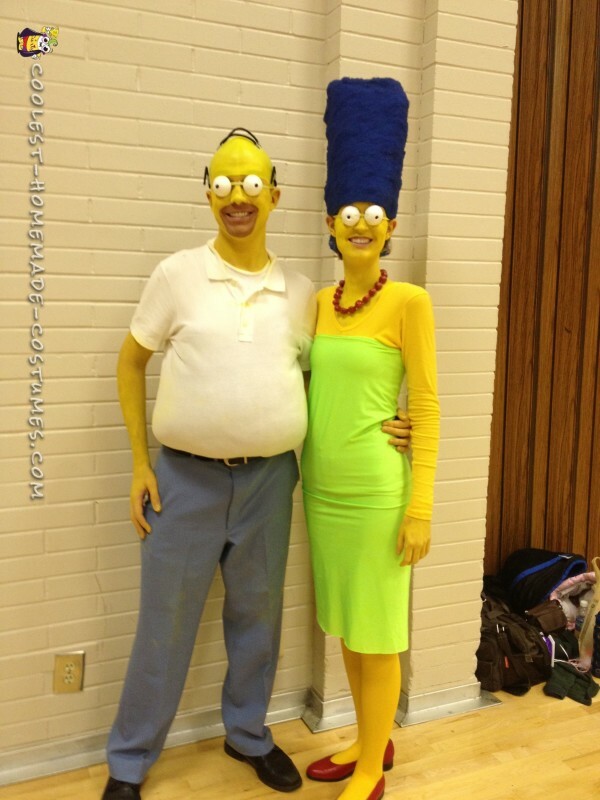 One day I was researching couple’s costumes and I saw “Homer and Marge Simpson.” There were lots of different options, but none that were really that spectacular. 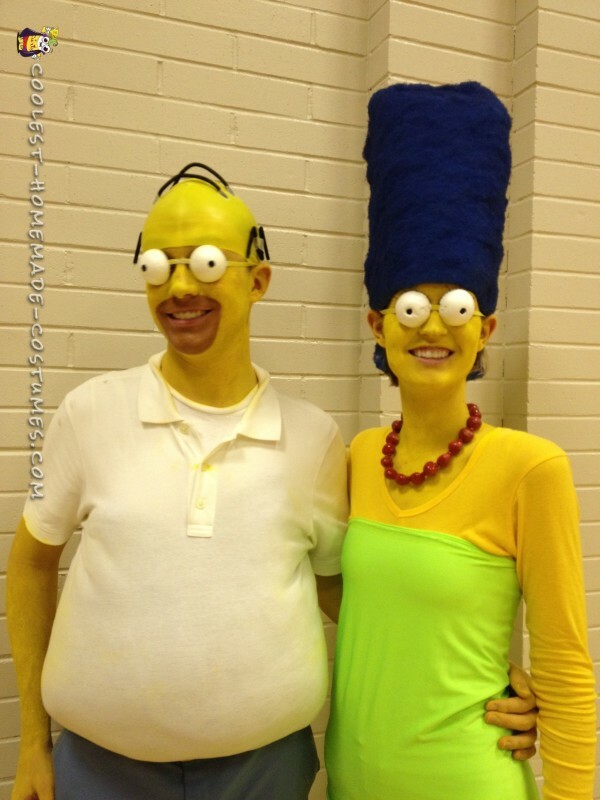 I decided then and there that we were going to be Homer and Marge Simpson and we were going to do it right! We always had the idea in the back of our minds, so whenever we would travel somewhere we’d hit up the nearby thrift shops. We very slowly started gathering the various pieces of our costume. Blue Pants: Thrift shop find. Hair (or lack thereof): We used a yellow swim cap and glued on black pipe cleaner for his few hairs. Beard: We used a dark brown foundation. It worked great! Yellow Skin: Lots and lots of costume body paint. Green Dress: To start out, I needed to find some green fabric. Fortunately, I found the perfect color at Joanne’s. Sure I had to wait in line for 2 hours to get it (why do they torture us so) but it was worth it in the end. 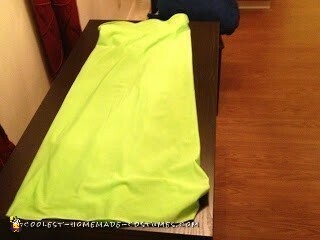 I measured myself and sewed the stretchy green fabric into a simple tube. Yellow Skin: Now one of the most difficult parts of this look is getting all of your yellow items to match. My husband and I didn’t want to have to paint our entire bodies yellow so that meant scouring thrift shops for the perfect hue of yellow. 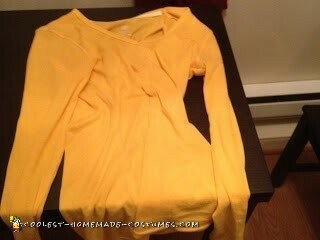 I found a perfect long sleeve yellow shirt at a thrift shop but it was XXL. Luckily I have a friend with mad sewing skills and together we were able to take in that shirt until it was skin tight. I found yellow tights at a thrift store but they were a little too bright of a yellow so I was able to put white tights underneath to soften it to match my top. 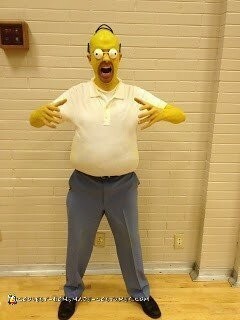 I did end up having to paint my face, neck and hands yellow with a little costume body paint. Red Shoes: These were a magical thrift shop find. They were right in my size too! Red Necklace: I found this necklace at a thrift store. It was originally a pale pink so I spray painted it red. Marge’s famous blue hair: I got some card-stock and made a mold of what her hair looked like. 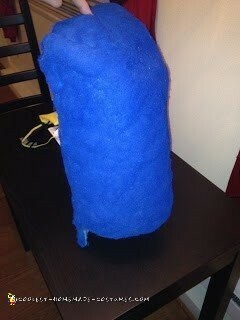 I then wrapped quilt batting all around it until it had the right shape. Then I spray painted it blue. It took a few coats to get it looking good. *Eyes: Making these eyes was the bane of my existence! I took Styrofoam balls and cut them in two and hollowed them out with an X-acto knife. 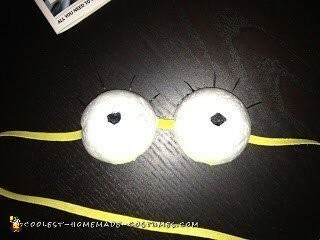 I then took some black mesh and glued it inside the eyes to create the pupils and make a hole to see out of. 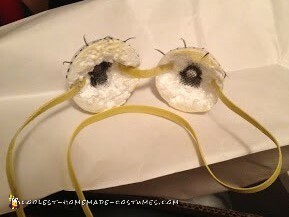 Hollowing the eyes out wasn’t the issue, it was gluing the eyes to an elastic band to put around our heads. You see I had foolishly bought super glue that dissolved Styrofoam. 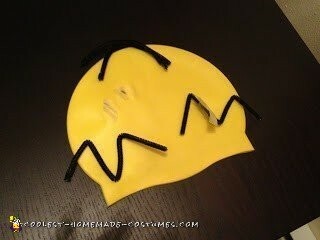 Of course I waited until the last minute to finish up our costume. So here I am late at night, with super glue that is melting my beautiful Styrofoam. Oh the horror! Miraculously, after messing with it for far too long we got that infernal glue to work. Whew! That was a lot of work. You would think that I was doing all of this work to win a contest of some sort right? Wrong! We did go to a few costume parties but NONE of them had a contest that year! Though I will say that we got some of the best reactions that night! Everyone was so impressed! We were the stars of the evening and everyone wanted a picture with us. That’s the beauty of creating a homemade costume. It might take you a little more time and energy but the end result is worth the cost.